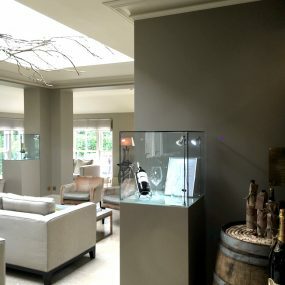 If you are looking to display art, sculpture or jewellery on display pedestals this image shows beautifully how displays can work in a retail environment of such products. The lit glass display cabinets on the left, show items which are smaller which the artists would not like to be touched by customers unless they asked in the shop for a closer look. What Display Pedestals Are In This Picture? This Art Gallery and Shop have plinths at varying heights which are all 40cm x 40cm square tops. The heights are: 15cm, 33cm, 70cm, 75cm, 80cm, 85cm, 90cm and 95cm to create the varied heights display. 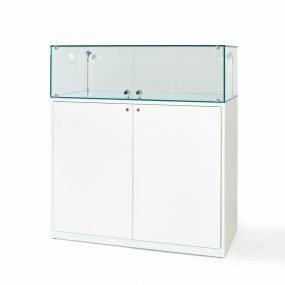 The glass display cabinets in the picture are 100cm Wide, 50cm Deep and 30cm high with battery powered lighting, with doors on the black of the plinth with internal storage to store stock inside. What Are Display Pedestals Made From? The Pedestals are made from 12mm Medite MDF. Medite are the top quality MDF suppliers in the UK. The MDF is hand cut on our top of the range Felder machinery, which then cuts a lock-mitre joint around the edges of the panels. The large surface area from a lock-mitre joint compared to a mitre joint, gives a larger surface area for gluing and therefore a more sturdy plinth which will hold more weight when assembled. The edges are routed and have a 3mm radius, the edges are then sanded and primed so that they are smooth. If you would like a sample of our spray finish with rounded smooth edges please contact us and we are more than happy to send you samples in the post. The spray finish is what sets our pedestals top of the range in the marketplace as no other provider gives a spray finish as standard. The primer coat smooths the surface of the MDF and prepares the wood for its’ top coat, where a polyurethane paint is used. This is the same paint and technique that is used to spray cars. We complete this whole process in house which means we have ultimate flexibility on products and timings compared to those who outsource. What Customisations Are Available On The Plinths? 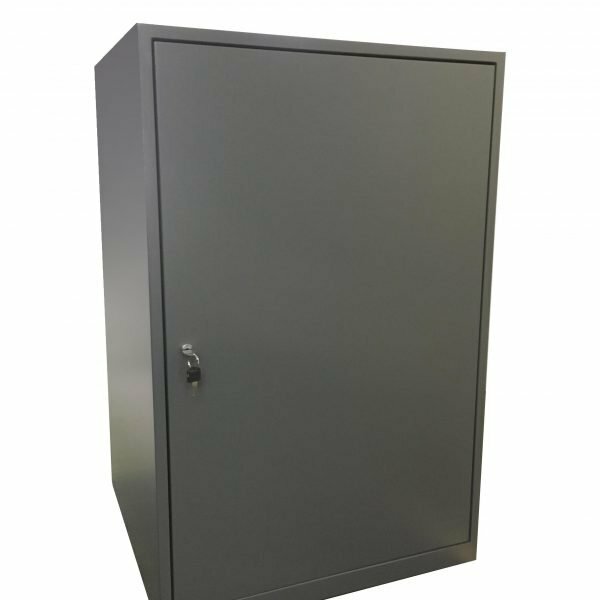 Lockable Doors – By cutting pieces in one side which allows space for a door to be fitted, it means that the inside of the plinth can be used for storage purposes. Internal Shelving – When a door has been added we can add internal shelving which is in the same colour spray finish as the outside of the plinth. Cable Access / Cable Management – Cable Access Points can be drilled in to the top or the side of the plinth. If you would like battery power so that you do not need to connect power supplies into the mains this is entirely possible as we wire our LED glass cabinet lighting in the same manner. Cable management can be installed on the inside or the outside of the plinth depending which is preferential to the customer. Reinforcement For Heavy Items – Plinths in the past have been made to support weights of over 200kg and we fix reinforcements on the inside for such purposes and they will be tested before delivery. Graphics and Logos – If you would like your logo or branding added onto the plinths we can provide this for you. There is a wide range of colours in stock including primary colours and metallic effects. We can match a specific colour if you require and we can send a sample in the post to you. We can take orders which are entirely bespoke designs for display pedestals. Sizes are not a problem we can make any size up to 2m in one dimension for you without a significant waiting time. However there is a limited availability for entirely bespoke creations due to their timely nature, so we recommend for products you have designed and we need to manufacture from scratch, we need at least 8 weeks notice if this product has not been created before to ensure we can meet deadlines necessary. For a quotation, please contact us using either the form below or call the office on 01934 708 717 where Kirsten will be more than happy to handle your queries.